I’ve always maintained that there’s an important distinction between being a geek and being a nerd. This is probably because I for one strive to be a geek but would be offended for days if you call me a nerd – seriously, what a great way to send me into a spiral of introspection – I’d be awake at night wondering whether my pants we hitched up too high or if maybe I should lose the pocket protector (but as uncool as the protector is, ink stains are way uncooler). If you also feel the need to determine whether you’re a geek or a nerd for once and for all then here’s an infographic on Geek vs Nerd which attempts to draw that line in the sand. I find it fun and informative enough to include here and the more I look at it the more I find that line blurs again. On first glance it seems the overarching difference between geeks and nerds is social awkwardness versus hip factor. It’s entirely cool to be a geek these days, but geeks who can’t take advantage of this new-found popularity because their social ineptitude is too overwhelming to get over… well, sorry, you fall back into the category of nerd. Is it me or is the nerd less annoying? Ouch! Thats trying a bit hard methinks. Just enjoy said bass and Malbec, don’t tell me how cool that makes you, go back to nerd jail, do not pass go, do not collect your beers on the way (sorry house rules). In fact you probably don’t have to go to nerd jail as such, you were likely already there but just didn’t know it. 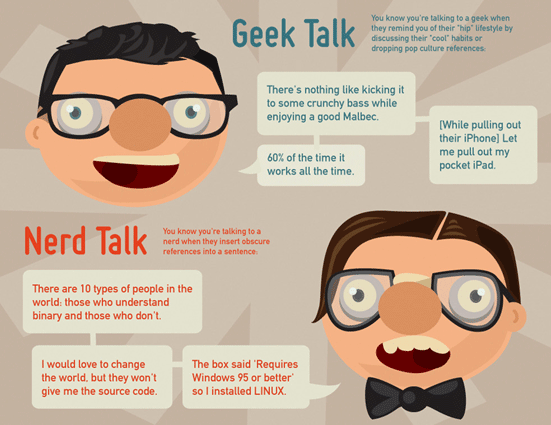 According to the infographic 59% of geeks think geeks are extremely intelligent as opposed to only 43% of non-geeks who hold the same opinion. In fact, geeks seem to flatter themselves in every category but the telling stat is that 54% of non-geeks think geeks are socially awkward while only 34% of geeks see themselves in this way. We’re not as cool as we think! That’s weird because my closest friends are geeks but they’re also really genuine, funny, generous, intelligent… Oh right, wait a sec’, that’s a case of geeks thinking geeks are “all that” again isn’t it. It seems it’s just us geeks making some distinction between geek and nerd that the majority of the rest of the world isn’t making. Therefore geek = nerd in denial. Sorry gleeks, you’re glerds. I think I may have just reached stage one of nerd recovery.